CPS Camp No.48, Marienville Pennsylvania. Camp Marienville, path leading top Educational Building. CPS Camp No. 48, Marienville Pennsylvania. 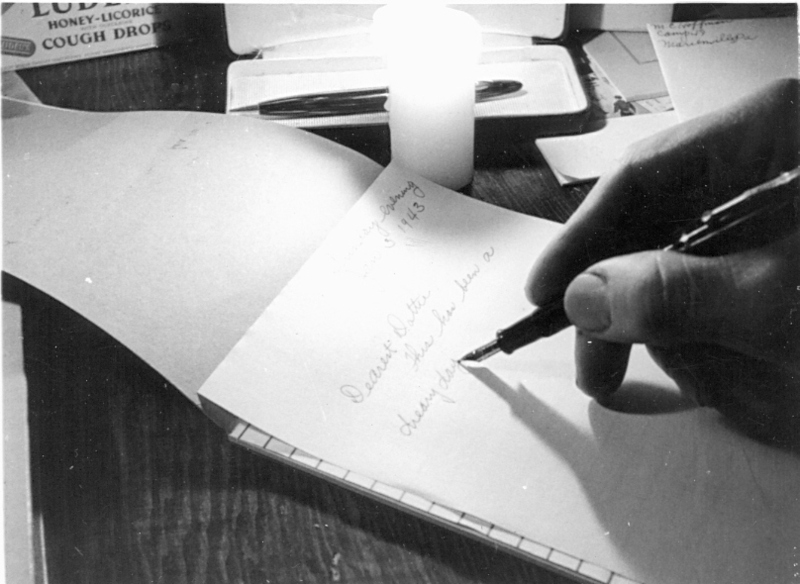 A letter home from Camp Marienville. 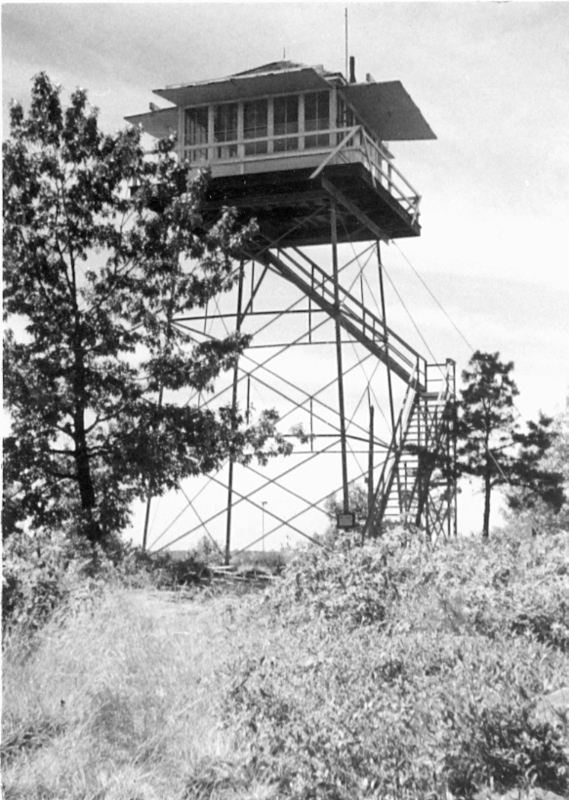 Ranger tower near Camp Marienville. CPS Camp No. 48, a Forest Service base camp located in Marienville, Pennsylvania and operated by the Brethren Service Committee, opened in October 1942 and closed in November 1943. The men fought fires and performed fire prevention duties. The Forest Service base camp located in Marienville, Pennsylvania was in Northwestern Pennsylvania, Forest County at an elevation 1,792 feet. The camp, formerly known as F-1, the first C.C.C. camp in the Allegheny National Forest, was abandoned in November 1941 before being reopened as a CPS camp. This unit began as an offshoot of CPS Camp No. 16 at Kane, Pennsylvania. During the life of the camp, 221 men served in the camp. When Marienville closed a little over a year later, the personnel for the most part returned to Kane. The same issue of Second Mile reported that 82 percent of the men reported Brethren affiliation upon entering CPS, 4 percent reported Methodist affiliation, 3 percent each Baptist and Jehovah’s Witness affiliation, 2 percent Free Methodist affiliation and 1 percent each Reformed Free Methodist, United Brethren in Christ, Episcopalian, Faith Tabernacle, Evangelical & Reformed, and Evangelical Mission Covenant. One of the men commented on the diversity of “church affiliations, races, creeds, basic and views on daily living . . . . The very fact that there are many types of persons here, and that these persons have many differences of opinions, gives us great opportunity for outward, immediate expression of the extra-tolerant attitude pacifists should have, even in our daily activities and conversations”. (Second Mile, July 1943). The January 1943 issue of the camp paper, Second Mile, described a variety of work at the camp. The men worked forty-eight hour weeks on varied projects. They built a camp bridge, gathered moss to protect 700,000 newly planted trees, built roads, served as crew in a gravel pit and did stone quarrying. They staffed fire towers in emergencies. 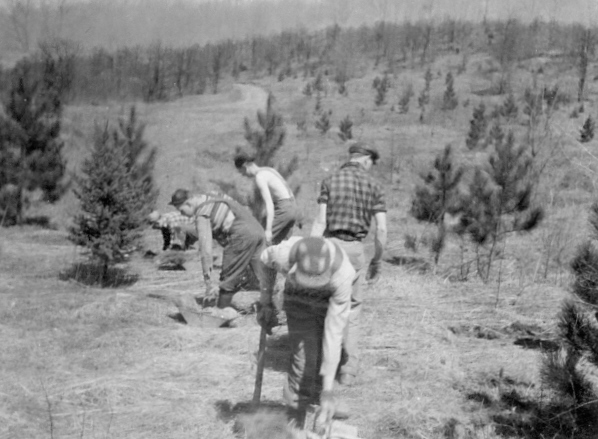 Many men maintained forest roads in both Elk and Forest Counties. 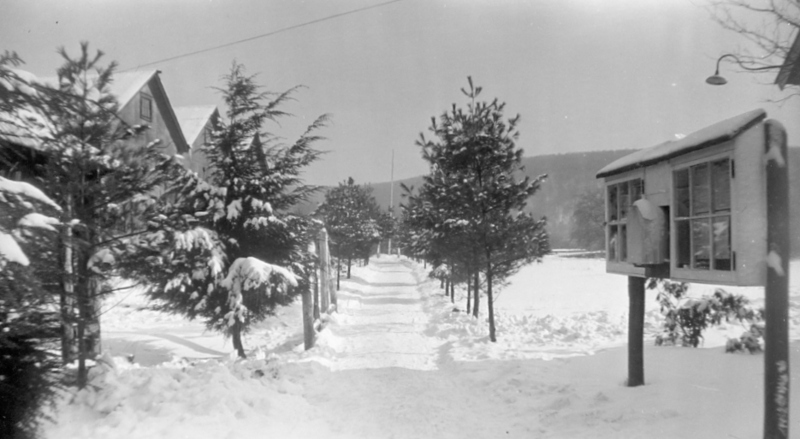 A group of the men were stationed at the Forestry Headquarters in Marienville, performing clerical work (Seacrist, Shenk and Fridinger) and maintenance duties (Berkey, Hoffman and Blough). Some served as cooks for the camp with Paul Blough heading the crew. Others staffed the laundry, performed “handyman duties” as well as serving as clerks in property, personnel and the dispensary. For those men who objected to engaging in work that could result in products used in the war effort, alternative work continued to be provided. In this camp, men regularly gathered as an assembly of the whole. They set up a camp council, which worked with the Camp Director, Assistant Director and the chair of the religious committee. The assembly first elected a temporary council of five men—Byron Berkey, Dwight Reiman, Wilmer Fridinger, Elgin Weaver, and Paul Blough—to work on organizational problems and issues. They set up a committee structure to represent various activity interests of the men, with the committee membership chosen by the assembly. The permanent council, “not to exceed ten members”, included representatives from each of the barracks and from the activity committees. The constitution was approved with some modifications from the assembly on December 8, 1942. (Second Mile, January 1943). Men regularly spent “off hours” in the recreation hall to play billiards, ping pong, attend special classes, meet in study groups, sing in the chorus, directed by Lee Weaver, or engage in other activities. By February, 1943, activities included photography and manual arts. Second Mile reported classes in Animal Husbandry, Spanish, Swedish, public speaking, music appreciation, first aid, post war-reconstruction at home and abroad. The men participated in discussion groups on New Testament Ethics, Techniques of Pacifism, and regular Bible study. The library provided many resources, including a collection of records for listening to music. The men published the camp newspaper Second Mile from January-February 1943 to July 1943. 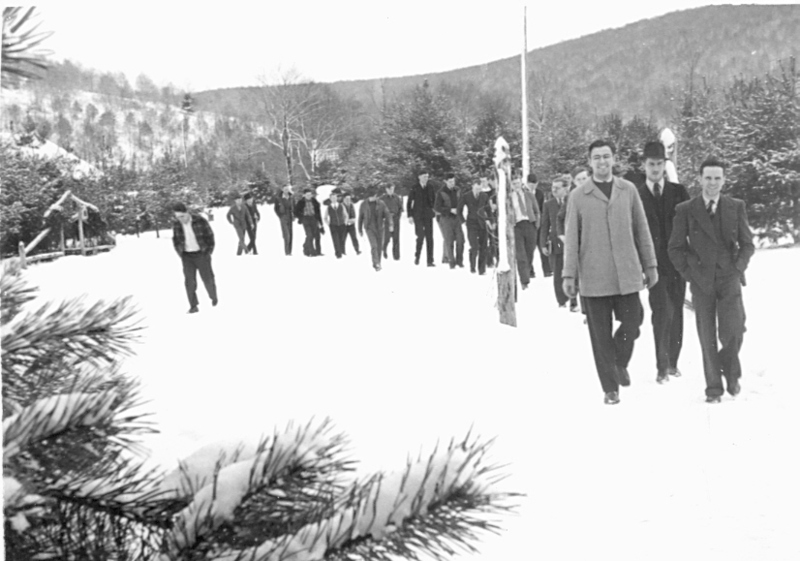 For information on Brethren base camps see Leslie Eisan, Pathways of Peace: A History of the Civilian Public Service Program Administered by the Brethren Service Committee. Elgin, IL: Brethren Publishing House, 1948. Second Mile I:1 (January 1943); I:2 (February 1943); I:4 (July 1943) information compiled by Anne M. Yoder, Archivist, April 25, 2011, Swarthmore College Peace Collection: American Friends Service Committee Civilian Public Service Records (DG 002), Section 3: CPS Camp Periodicals, Box 11.